Mr. Bill Yuhnke says: “All lives have equal value”, so he supports and helps to other communities. On behalf of those we serve, Saving Grace Ministries and our community, I would like to take this opportunity to personally express not only our gratitude, but offer our sincerest thanks to you for your financial support. Thank you for believing and walking along side us. For 20 years we have been serving Western New York providing services to those often marginalized and without voice. Today hundreds upon hundreds of people and lives have been positively impacted…helping individuals find their rightful place in community while witnessing restored lives and improved public safety. 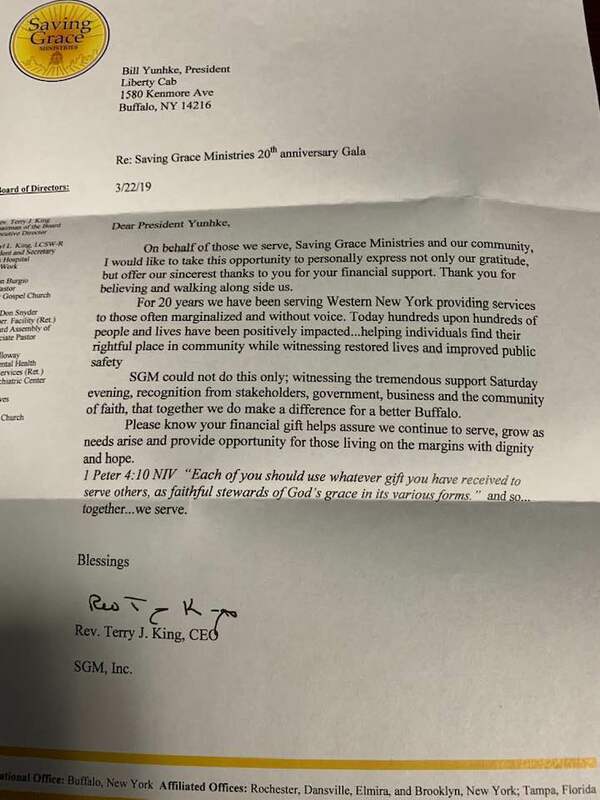 SGM could not do this only; witnessing the tremendous support Saturday evening, recognition from stakeholders, government, business and the community of faith, that together we do make a difference for a better Buffalo. Please know your financial gift helps assure we continue to serve, grow as needs arise and provide opportunity for those living on the margins with dignity and hope. I Peter 4:10 NIV “Each of you should use whatever gift you have received to serve others,as faithful stewards of God’s grace in its various forms.” and so…together…we serve.